Cisco’s Unified Computing System (UCS) provides a solution that integrates the server, network and storage resources that are used within a modern datacenter. It does this through the deployment of equipment that is managed through a single management system (UCS Manager). The idea is to save on a number of different costs within the data center, including equipment and support costs. When deploying a system that is closely integrated and provides the ability to provision the server, network and storage resources in one step, support costs can be reduced and configuration errors avoided. To create this system there are a number of different components that are deployed, including fabric interconnects, blade server chassis, fabric extenders and the blade servers themselves. This article takes a look at these different components, what they are and what they provide to the UCS solution. At the center of UCS is the UCS 6100 Fabric Interconnect, it provides the management and communications backbone for the entire solution. For management, the UCS Manager software is embedded in the appliance itself. For communications, the appliance offers lossless 10 Gigabit Ethernet and Fiber Channel over Ethernet (FCoE) functionality and connectivity. Each of the 10 Gigabit ports on the appliance offers a line-rate, lossless connection regardless of packet size or services configured. There are three different models of the Fabric Interconnect that are currently offered: these include the UCS 6120XP 20-Port, UCS 6140XP 40-Port and 6248UP 32-Port appliances. The fabric interconnect acts as the central location to connect together the different blade chassis. 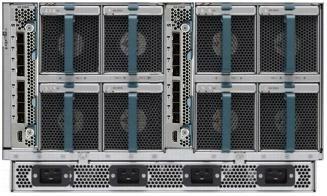 In total, the UCS supports up to 40 different blade server chassis and 320 half-width blade servers. The UCS fabric extenders connect into the rear of the UCS 5100 Series blade server chassis and provide both external connection to the fabric interconnects and internal connection to each of the blade server slots. It is important to note that the fabric extenders do not switch traffic, this is offloaded to the fabric interconnects. Currently, two different fabric extenders exist: the 2104XP and the 2208XP. Table 2 below shows the different characteristics of each. Mezzanine I/O Adapters provide the ability to support a number of different network configurations including multiple 10 Gigabit Ethernet or Host Bus Adapters (HBAs). There are a number of different options that will not be reviewed in this article but had to be mentioned given the content of this article. The UCS solution offers an innovative, very expandable option that would easily provide for even the largest of organizations. Those organizations looking into building a new data center or upgrading their existing data center should take a hard look at when Cisco’s UCS solution can provide and how it affects the TCO of the data center in general, especially as it relates to on-going support costs.